A Christmas Carol features a spirited ensemble of 23 performers who bring Dickens’ fable of redemption to life on a magical set created by noted designer James Othuse. This fully-staged musical version of Charles Dickens’ classic tale, A Christmas Carol, has become a Yuletide tradition. 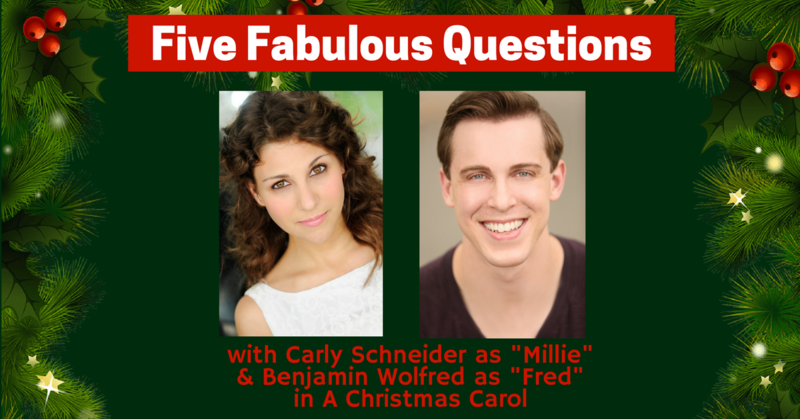 Learm more about a few of the cast members before seeing the show at the Fabulous Fox December 14 - 17! I’m a SEMO gal, born and raised! I grew up in Cape Girardeau, MO, and visited St. Louis countless times growing up—Cardinal games, school field trips, the Magic House, shopping trips, visiting relatives and friends, but most importantly...the Fabulous Fox. My first Fox Show was “Rugrats Live” (I’m dating myself), and I was absolutely ENAMORED by the Fox. It was a truly magical place, like nothing I’d ever seen—something out of a storybook. I came back as often as possible; school field trips, birthday presents, and eventually I got my driver’s license, and my sisters and I bought season tickets together. Those trips and shows are among some of my most precious memories with Courtney and Chrissy. I have not! But it’s always been a dream of mine to perform on the Fox stage. When I found out our tour was coming back to the Fox this year, I shrieked, cried happy tears, and did a happy dance—December 14th is definitely going to be an emotional day. My first Broadway show was The Addams Family—all original cast, magical tech, and belly laughs! Oh, goodness. Well, when I was just a little Carly, I used to make up shows in my Grandma’s basement. My parents, aunts, uncles and cousins were my first audience! It wasn’t until I was in a 7th grade production of “Little Mermaid” that I realized my love for dress-up could lead to a lifetime of performing. I played Ursula’s eel “Flotsam,” had 6 glorious lines, and was forever changed. I’d say the biggest challenge is our abbreviated rehearsal process. We put up the entire show in just two weeks. We learn all the harmonies, choreography, blocking, and then add on an understudy track before hitting the road. It’s a lot to process, but such a rewarding challenge. And the Caravan truly excels at hiring people who are up to the task—My coworkers are incredible! My favorite advice to share with young performers who are finding their way in the industry is to remember to be YOU. Studying the greats and emulating their stellar voices, acting, and dancing is wonderful, necessary even. But the best thing you can bring to an audition room is the special spark only YOU have. That spark and a strong work ethic will open so many doors to you! My beautiful family! All the Schneider/Heisserer/Seyer/Gorman/Drury clan are showing up for this special weekend, and I cannot WAIT to share my passion, this gorgeous show, and the Fabulous Fox with them all. I couldn’t dream of a better Christmas present! Oh, and maybe some Imo’s pizza. No, this will be my very first time in St. Louis! I'm looking forward to checking out The Gateway to the West though! I haven't performed in St. Louis before, but I am excited to add it to my list. My very first Broadway show was Phantom of the Opera. I took a family vacation as a kid and my Mom made sure to get a few classics in, including Lion King and The Producers. It all started in high school. I was a band kid and a few of us randomly auditioned for the school musical, West Side Story. We all ended up getting cast and kind of took some of the parts away from the chorus kids who had unofficially pre-cast their roles. Needless to say, they were not too pleased. Anyway, the curtian rose on opening night, and I knew in that moment that this is what I wanted to do. I have a quick change into the Ghost of Christmas Future costume in act two. It's a 6 foot pvc pipe skeleton with robes draped over it that I wear on my shoulders. Then I must keep my balance as I get wheeled on stage standing on a small platform. It's absolutely worth it getting to be a part of the eerie and fantastical Christmas Future costume, but I definitely had to get used to wearing it. 4. What advice do you have for aspiring performs? Find out why you are passionate about theatre. Hold on to that and never let it go. It will always keep you moving forward. It's also important to have a solid support system, whether it is friends, family, or religion. Your support system will help you move forward not just in theatre, but in life as well. I'll be nerdy and totally honest with you: Star Wars episode 8 comes out while we are in St. Louis and I already have my ticket to see the movie. Other than that, I'm definitely going to the City Museum. A playground for adults?! I've only dreamed about such a thing! And in real life been kicked out of several parks for being "too big to use the playground equipment." But I'm not bitter.